At Lord’s, in the second Test on India’s England tour in 2014, on Day 1, Ajinkya Rahane walked in and perhaps played the innings of his life. From 86/3, he lifted India to 295 courtesy a brilliant, counter-attacking 103. He had been excellent in South Africa and New Zealand prior to that tour, averaging 69.66 and 54.00. India seemed to have finally found someone to carry their batting in overseas Tests. Rahane carried forward that form to Australia, making a smashing 147 at Melbourne and averaging 63.53 in the series but his form dipped back in the sub-continent. It has been a queer trend in Rahane’s career. 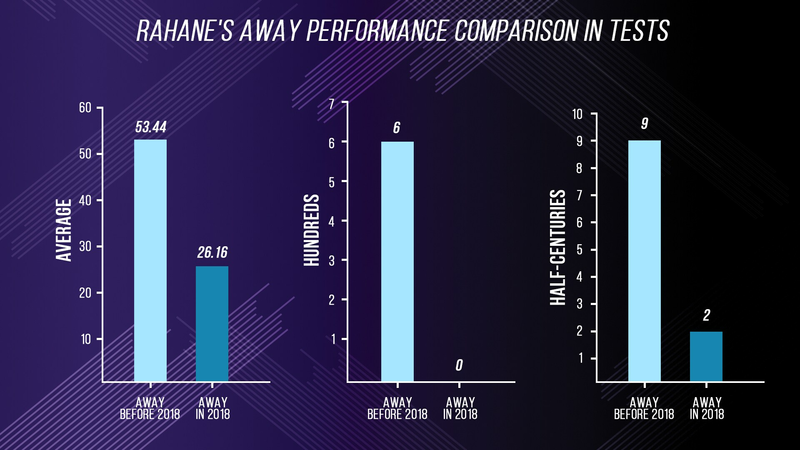 Much unlike his Indian counterparts and batsmen from the sub-continent in the history of the game, Rahane has a better record away from home. It is not just better in terms of averages but also in terms of scoring hundreds or half-centuries. 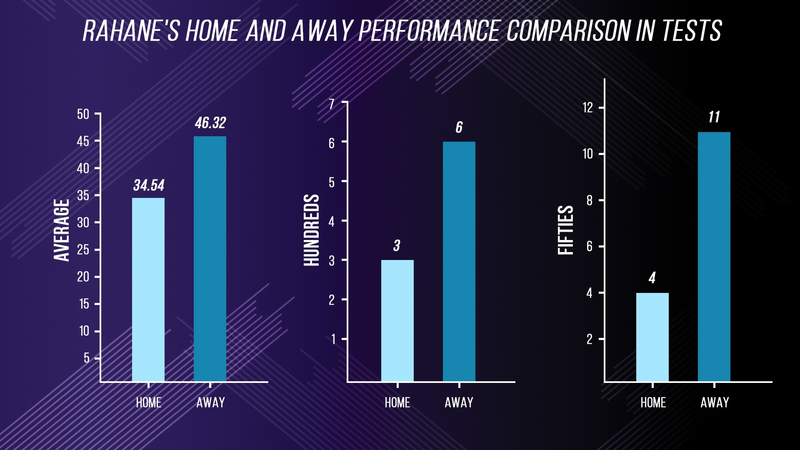 An average of 34.54 at home is easily overshadowed by a brilliant 46.32 away from home. If he has three tons at home, the number is doubled in overseas Tests. He has also been more likely to score well overseas than at home. All of this should ideally make Rahane a mainstay on overseas tours, particularly in SENA countries where he has flourished with four of his 10 hundreds coming here – one each in South Africa, England, New Zealand and Australia. However, current form is a tricky thing and this Virat Kohli-led unit believes in giving their in-form batsmen top priority. This led to Rahane’s axing for the first Test in South Africa earlier this year with Rohit Sharma preferred ahead of him despite the fact that the former was the vice-captain of the side. The experiment, though, flopped and Rahane, coming off the back of a very average home season where most Indian batsmen made tons of runs, was back in the mix. But he failed to replicate his form from 2014. With scores of 9 and 48, Rahane failed to show the spark and although it proved to be enough to get a whole series against England in August, it failed to translate into runs. With scores of 15, 2, 18, 13, 81, 29, 11, 51, 0 and 37, Rahane’s England tour was far less successful than his previous one. With averages of 28.50 and 25.70 in South Africa and England earlier this year and a pretty poor home record in the interim, Rahane is in danger of watching the first Test in Australia from the sidelines. His away average was 53.44 before this year began. This year, he has averaged 26.16 with just two scores of 50 or more. His Test career as such has undergone a dip in the past couple of years and by any yardstick, there is little reason to keep Rahane in the eleven, particularly with his back-ups exhibiting good form. 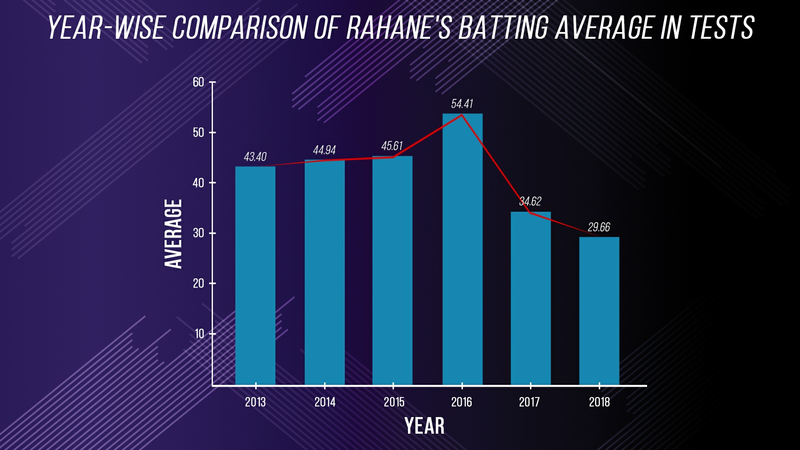 Starting off with a career average of 43.4 in 2013 that rose to 44.94 amidst a slew of overseas tours in 2014, Rahane maintained his prolific run-scoring until 2016, by when he was one of India’s most dependable batsmen in Test cricket. The dip, though, came with a run of home games – not Rahane’s favourite – and it has apparently led to a blip in his overseas performances. That it turned out to be a major sulk from his previous record at a time India are forging a group who play fearless cricket irrespective of conditions works against Rahane. India need Rahane to come good especially if they go in with five specialist batsmen to start the series. The ‘Old’ Rahane needs to be back.